A kinetic triptych impressionistic light mural in real time. Film clip of live images. Screen sizes 30’X40’ each; 136’ overall length. The project is a Lighted Gateway in West Hollywood, California, at the southwest corner of La Brea Avenue and Santa Monica Boulevard. 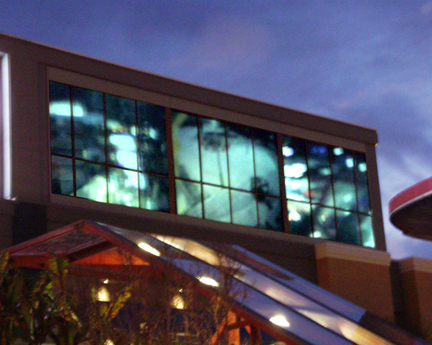 The Public Art Component of the project consists of video projections on a large screen area located in a building facade, facing the intersection. On this projected screen area, multiple color video projections are utilized to create a kinetic light mural. Adjacent to the triptych of video screens is a large-scale LED display which hourly picks up imagery from the site and acts as a visual emphasis to the imagery. This installation features a collage, incorporating three separate projections. The projections consist of a composed montage of images, creating an ever changing, kinetic light painting. The images perpetually change and still employ color, movement, and pattern from within this unique site. The use of soft, focused images allows for a degree of both painterly qualities and abstraction while still maintaining image-based projections. 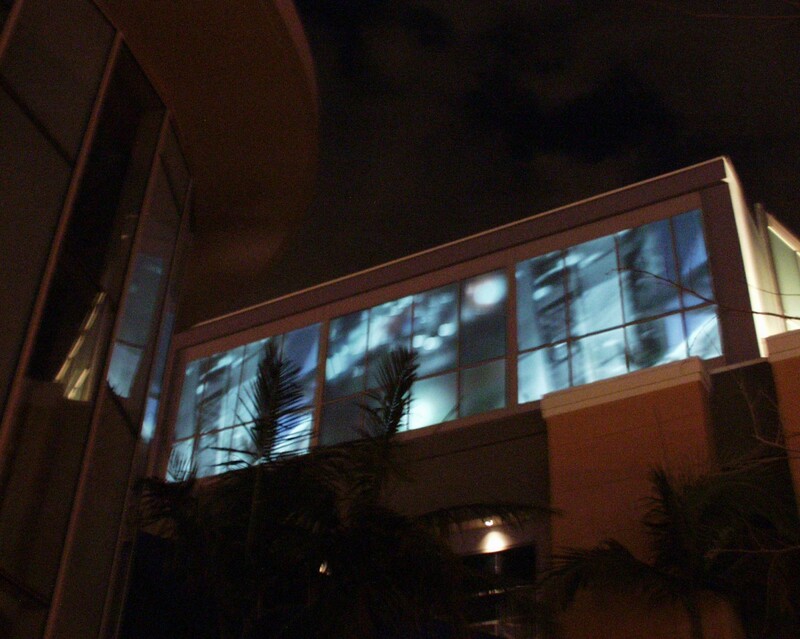 This projection installation is an extension of my work utilizing video projections in a variety of exterior sites. Since the 1970s I have projected on buildings, landscapes, and composed environmental situations. Imagery from this site reminds us of our real-time assessment of time and space. My use of soft-focused photography has always alluded to the relativity of time and position of the viewer, while maintaining a sense of location. The sense imagery of this location is illustrated via an impressionistic, kinetic, real-time experience. One can sense the imagery’s connection to the site without a literal identity connected to each image. The color, light and patterns never repeat, but still have a resonance of this location. 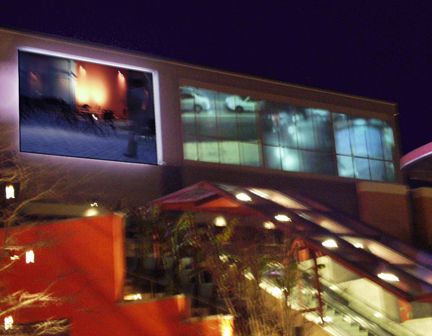 Multiple-screen, rear projection video on building facade. Details, including LED display element.